Having the right firebrick for your hearth is important. Stone Age Manufacturing's Full Size Buff Masonry Firebrick is a great refractory firebrick for hearth and cooking products. 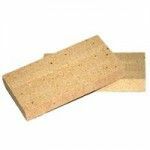 The thinner firebrick is great for multiple uses and applications, especially when building or lining your firebox. Get the firebrick you know you can rely on from Stone Age Manufacturing.